Hailing from the Island of St Croix, Midnite is one of the most promising roots reggae bands of the millennium. They are vanguards of conscious reggae whose profound and innovative lyrics are sincere and deeply rooted. Their CD recordings and live performances will have reggae and non-reggae listeners open to the messages they bring. Lead singer Vaughn Benjamin's electrifying voice seems an amalgamation of many great voices in reggae--soulful, chanting, edgy. Vaughn's potent lyrical style and his brother Ron's exquisite keyboards and musical directorship form the nucleus of this musical quintet. Midnite weaves the cultural lyrics of "old school" roots music with modern day experiences to create a unique listening encounter. Reggae - naked and raw is an apt description for Midnite's musical style, in which they forgo the frills of extensive remixes, overdubbing and other musical refinements. Midnite explodes in live performances with sets that often exceed three hours. Their vigorous, weighty sound, driven by the punchy bass lines creates a vibe that penetrates straight to the heart. These epic musical communions have earned Midnite an enormous following throughout the roots community. This is especially true in St. Croix, Puerto Rico, Brazil, St. Louis and here on the West Coast where they have toured extensively. By breaking all the rules, Midnite is setting a new standard. 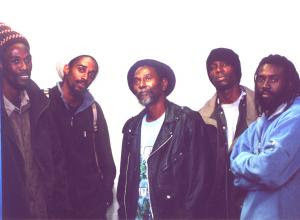 Armed with a firm foundation in Jah Rastafari, their natural talents, and a strong and uncompromising musical vision, Midnite champions a unique sound that is on the cutting edge of modern roots music. Tickets are 25 in advance at www.brownpapertickets.com and there will plenty of tickets at the door!